Shelter for the Dog and her eight kids. 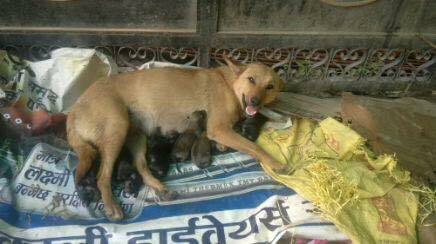 We received a message Facebook about this dog who gave birth to eight and covering her kids with her body on open sky. Felt bad about this news as it is monsoon season. Rushed to this place which is 10 KM away from my home. Prepared them shelter, feed some eggs, biscuits for mother and will continue feeding the mother and keep watching her unless the babies will grow up. My concern- Why not all the female dogs are spayed if Animal shelter of Kathmandu valley claims the territory for the dogs is theirs and doesn’t allow any other Animal Shelter to enter the area? Lets work for street dogs/strays instead of arguing with the territories. Saving other and helping others is helping yourself.